If this car d is in your hand or Graveyard: You can banish a total of 2 FIRE and/or Dragon-Type monsters from your hand and/or Graveyard, except this card; Special Summon this card. During your opponent’s End Phase, if this card was Special Summoned: Return it to the hand. You can discard this card and 1 FIRE monster to the Graveyard, then target 1 card on the field; destroy that target. If this card is banished: You can add 1 FIRE Dragon-Type monster from your Deck to your hand. You can only use 1 “Blaster, Dragon Ruler of Infernos” effect per turn, and only once that turn. 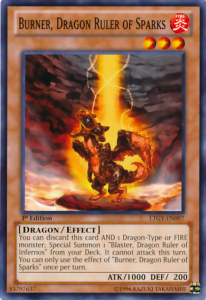 You can di scard this card AND 1 Dragon-Type or FIRE monster; Special Summon 1 “Blaster, Dragon Ruler of Infernos” from your Deck. It cannot attack this turn. You can only use the effect of “Burner, Dragon Ruler of Sparks” once per turn. If this card i s in your hand or Graveyard: You can banish a total of 2 WATER and/or Dragon-Type monsters from your hand and/or Graveyard, except this card; Special Summon this card. During your opponent’s End Phase, if this card was Special Summoned: Return it to the hand. You can discard this card and 1 WATER monster to the Graveyard; send 1 monster from your Deck to the Graveyard. If this card is banished: You can add 1 WATER Dragon-Type monster from your Deck to your hand. 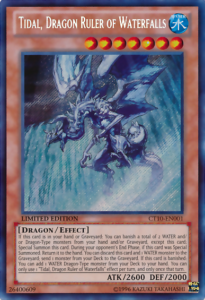 You can only use 1 “Tidal, Dragon Ruler of Waterfalls” effect per turn, and only once that turn. 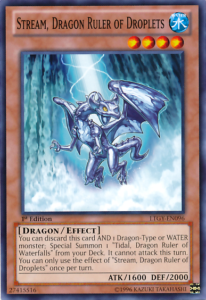 You can discar d this card AND 1 Dragon-Type or WATER monster; Special Summon 1 “Tidal, Dragon Ruler of Waterfalls” from your Deck. It cannot attack this turn. You can only use the effect of “Stream, Dragon Ruler of Droplets” once per turn. If this card is in your hand or Graveyard: You can banish a total of 2 WIND and/or Dragon-Type monsters from your hand and/or Graveyard, except this card; Special Summon this card. During your opponent’s End Phase, if this card was Special Summoned: Return it to the hand. You can discard this card and 1 WIND monster to the Graveyard; add 1 Dragon-Type monster from your Deck to your hand. If this card is banished: You can add 1 WIND Dragon-Type monster from your Deck to your hand. You can only use 1 “Tempest, Dragon Ruler of Storms” effect per turn, and only once that turn. 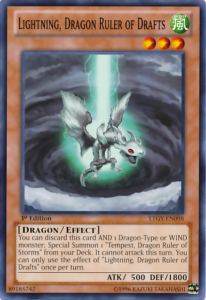 You can dis card this card AND 1 Dragon-Type or WIND monster; Special Summon 1 “Tempest, Dragon Ruler of Storms” from your Deck. It cannot attack this turn. You can only use the effect of “Lightning, Dragon Ruler of Drafts” once per turn. If this ca rd is in your hand or Graveyard: You can banish a total of 2 EARTH and/or Dragon-Type monsters from your hand and/or Graveyard, except this card; Special Summon this card. During your opponent’s End Phase, if this card was Special Summoned: Return it to the hand. You can discard this card and 1 EARTH monster to the Graveyard, then target 1 monster in your Graveyard; Special Summon that target. If this card is banished: You can add 1 EARTH Dragon-Type monster from your Deck to your hand. You can only use 1 “Redox, Dragon Ruler of Boulders” effect per turn, and only once that turn. 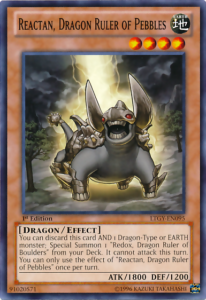 You can disca rd this card AND 1 Dragon-Type or EARTH monster; Special Summon 1 “Redox, Dragon Ruler of Boulders” from your Deck. It cannot attack this turn. You can only use the effect of “Reactan, Dragon Ruler of Pebbles” once per turn. 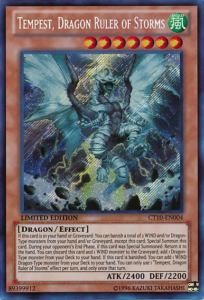 The Dragon Rulers and their babies were released to the Yu-Gi-Oh TCG on May 17, 2013 in the Lord of the Tachyon Galaxy booster set and made an impact on the competitive meta immediately. 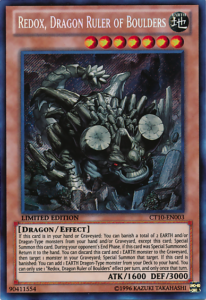 With Number 11: Big Eye being legal and Mecha Phantom Beast Dracossack being released, the Dragon Rulers had the Rank 7 pool they could access. Also with Sacred Sword of Seven Stars being a thing, the Dragon Ruler deck had more consistency as well as Super Rejuvenation and Dragon Ravine already existing for years at this point. But wait, Crunch, why were the Dragon Rulers so powerful? Simple, they all worked with each other. Each Dragon Ruler could be summoned from the hand or graveyard by banishing a Dragon and/or a monster of the Ruler’s corresponding attribute. Not only that, but when the big Dragon Rulers were banished, they could search a Dragon of their corresponding attribute as well. This is where the Babies come into play, as the Rulers could search the babies and the babies could be discarded with a Dragon or a monster of the corresponding attribute to summon the Dragon Ruler they represented. Burner for Blaster, Stream for Tidal, Lightning for Tempest, and Reactan for Redox. The effects for the babies were hard once per turns and you could only use one effect of each of the big Dragon Rulers once per turn. Despite those drawbacks, the deck was still very consistent. Consistent enough to take 6 of the top 8 spots at the 2013 World Championship and ended up being the winning deck of that year as well, with the only other true contender being Spellbooks, taking two of the top 8 spots, thanks to Spellbook of Judgment being released in Lord of the Tachyon Galaxy as well as the Rulers. With this performance from the Dragon Rulers, actions were to be taken on the September 2013 Forbidden and Limited List. On this list, all four of the Baby Dragon Rulers were forbidden as well as Super Rejuvenation. This however, did not stop the Dragon Rulers as Ravine Rulers was a powerhouse deck at the end of 2013 with all the big Dragons being at three as well as Sacred Sword of Seven Stars and Dragon Ravine, plus the release of Sixth Sense did not help, though it was limited immediately upon release, but that card was staple worthy, so Dragon Rulers were not the only deck to abuse this. This led to more hits on the January 2014 Forbidden and Limited List banning both Dragon Ravine and Sixth Sense being forbidden and all of the four big Dragon Rulers being limited. Hieratic Rulers did become a thing after the Dragon Rulers were all limited to one, but Duelist Alliance likely power creeped this deck out of the meta, for a short period of time. All it took was for one card to break the Dragon Rulers once again, Number 95: Galaxy-Eyes Dark Matter Dragon. With this simple card, Hieratic Rulers were seen as a major threat to the competitive meta, the consistency and power plays were there in that deck. 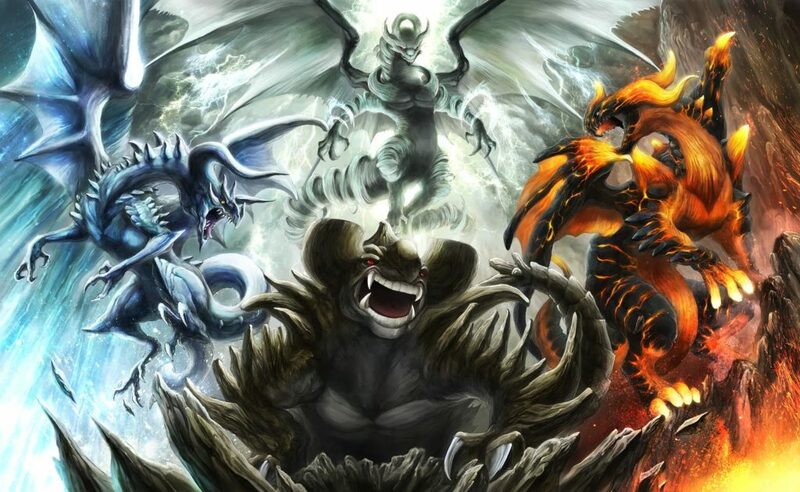 Konami, however; decided they had enough of the Dragon Rulers causing degeneracy, and on the April 2015 Forbidden and Limited List, all four of the Dragon Rulers finally saw their spot in the forbidden section. In exchange, all four of the babies were unlimited and Sacred Sword of Seven Stars went to two and eventually three, and it would take a while before Dragon Ravine finally became unlimited in September of 2017. The Dragon Rulers have cause a lot of destruction in their path as well as a lot of card to get either limited or forbidden on the Forbidden and Limited List for the TCG as well as the OCG in similar ways. Heck, I think the OCG even limited Number 11: Big Eye thanks to the Rulers. All of these hits and the reign of dominance represents that there was a mistake in the Dragon Rulers and I can easily point it out. The one problem that caused the Dragon Rulers to be broken is very simple, they were generic Dragon support as well as generic Attribute support. 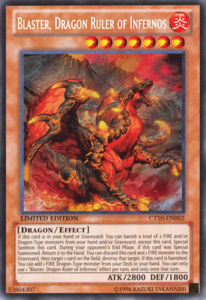 The Dragon Rulers gave boosts to many Water, Earth, Wind, and Fire themed decks and the effects they had were pretty handy, especially Tidal for Mermail Atlanteans, Blaster was nice for Fire Fists to have, Tempest was cool in Dragunity, I remember Redox Gadgets being a thing because Redox was so good and it was another Level 7 to overlay with Machina Fortress. However, it was the Dragon part that made them degenerate. Having the Rulers banish other Rulers to summon themselves as well as to get searches from the banished Rulers was too strong and made the deck too consistent. 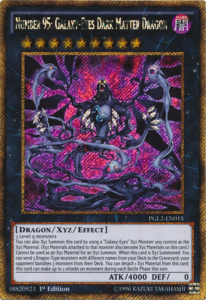 Also being able to banish other Dragons made the Dark Matter Hieratic deck just too strong, as the power output from the deck was insane from the Rulers. All we would have to do is remove the Dragon part from the summon effect and I feel the Rulers would not be that big of a threat. Redox could give Earth decks that Monster Reborn effect, Tempest can set up the grave for Dragunities and get cards banished for Ritual Beasts, Blaster can give any Fire deck a chance to destroy a card at the cost of two, and Tidal can boost Atlantean Mermail by triggering Atlantean effects and setting up the grave for Abyssgunde. It is just the Dragon part that can be an issue, cause Dragons can put out many powerful boards already, and the Rulers just makes the power output of any Dragon decks that much higher. The babies should only work with the attributes as well so Dragon decks can still avoid getting big monsters with ease. The big Rulers can still search for Dragons of their attribute, because otherwise we would have a problem if each attribute had a generic searcher. Limiting the Rulers and their babies to their attributes would be fair, but not broken, and with the errata to just work with attributes and not Dragons, the Rulers would be a welcome addition to the game in my opinion. The Dragon Rulers working with Dragons was a big mistake. Though I guess we can be thankful they helped prevent Spellbooks from being Tier 0, that doesn’t make the Rulers fair. The errata to work with only Attributes would be fair and give several decks a boost and not be overly degenerate, especially in this day in age where it seems every set introduces another Tier 0 deck. Next articleAre All-In-One PC’s Worth It?